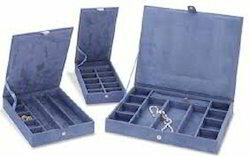 We make varous types of foling boxes for our valuablt clients. Our mesmerizing gamut of Jewelry Storage Box is highly appreciated by our clients for beautiful patterns & designs, intricate artwork, exquisite and durable finish and lustrous appearance. Looking for Folding Box ?